Cohort 3 student Gergely Hantos took part in the Cambridge Spark Applied Data Science Bootcamp. 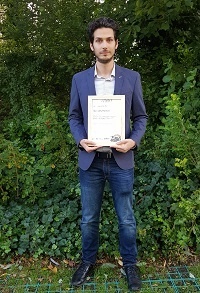 Gergely, who is based at Heriot-Watt and supervised by Prof. Marc Desmulliez, took part in the 6-months Cambridge Spark Applied Data Science Bootcamp. The course gave an excellent knowledge of the most relevant Data Science skills matching industry needs. Each student had to carry out a one-month real-life project backed by industry partners that covered problem understanding, data cleaning and feature engineering, visualisation, model selection, training, evaluation and optimisation. Gergely worked on a project for Entomics, a biological waste valorisation company that transforms organic waste into high value agricultural products using insect larvae as a unique bioconversion engine. The objective was to create a predictive machine learning model that optimizes the bioconversion by predicting the daily waste intake of the larvae. Gergely delivered a solution that worked with so little prediction error that Entomics was able to use the output immediately. The outcome of this project has opened up a specialised software engineer position at Entomics. A conference paper based on the work achieved was delivered for the First Symposium on Smart Systems Integration (SS1S) by Gergely on the 31st of August 2018 in Balatonvilágos, Hungary and is currently under review for publication in Periodica Polytechnica Electrical Engineering and Computer Science. 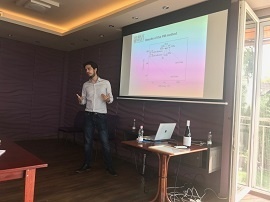 Cambridge Spark, the company delivering the course was also impressed by the work, thus they wrote a blog article about the project available here: Project Partner Case Study: Entomics that includes a video interview with Fotis Fotiadis, Co-Founder and CTO of Entomics.